Every now and then I like to play with the photos I take on my iPhone in Camerabag. It’s a great app and you can get some great effects through it. 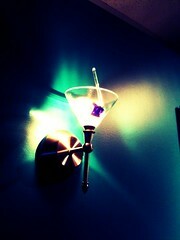 I used the cross-process effect here on a martini glass light I took a photos of in a local restaurant.